The one maybe decent outcome of the Trump presidency may be the de-festishization of the office. Many years ago, during the George W. Bush administration, a friend of mine and I were talking about visiting the White House if we happened to be on a sports team that won a championship (spoiler: it didn’t quite happen, for whatever reason, mostly that neither of us are good at sports). We decided that, yeah, push comes to shove, I suppose we would. After all, when else are you going to get a chance? And this isn’t out of some misplaced nostalgia for the Bush administration ever. 43 was a remarkable disaster in nearly every way. The glimmers of humanity, especially in contrast to what we have now, aren’t nearly enough to make one long for the seemingly halcyon days. Just because the 45th President is remarkably, impossibly worse doesn’t make those days good. Still, though, as bad as he was, we’d still go see him. Getting feted by the most powerful person in the world, who is secretly jealous of you, is a perk of success. But why? Thanks to Donald Trump, the Presidency doesn’t mean anything anymore. The office has been permanently degraded. And that’s not just because of his flagrant corruption, baseline cruelty, or harsh right-wing policies. It’s not because he wraps himself in populism while pushing Andy Puzder to be Secretary of Labor (even though that failed, never forget this admin’s instincts). It’s because he is so remarkably unfit to be President, so wholly uninterested in the job, and so clearly a product of both the most toxic and most vapid elements of our culture. In short, it’s because he’s a know-nothing reality show dingdong and a cheap con-man, a penthouse swindler in a cheap suit. And he’s President. So really, why bother going to the White House? What does it mean to “Respect the Office” when the office isn’t at all worthy of respect. It was a weird emotion anyway, a wholly undemocratic notion that the elected head of one of the co-equal branches of government was the Father-Confessor to the nation, a strange bipartisan notion. I’m not saying the Presidency isn’t special; it’s the only nationally-elected office, obviously, and so he has to appeal to the widest amount of people, is the most well-known, etc. But it’s downright odd to have a “President’s Day”. Washington, Lincoln: worthy of admiration, even love. And it’s good to combine the two into a national holiday so that certain people get the day off*. But it is weird to have a day that we celebrate an elected office, and the people who held it. James Buchanan. Richard Nixon. Franklin Pierce. 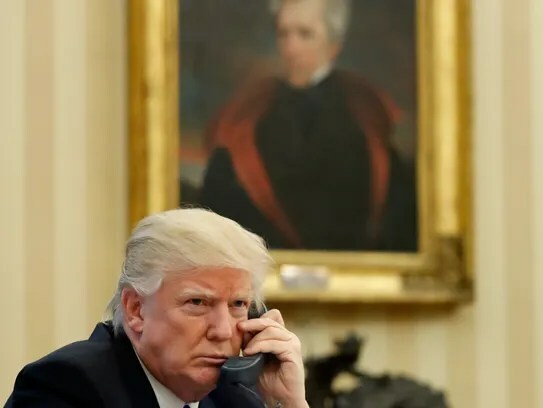 The genocidal Andrew Jackson. Warren G. Harding. George W. Bush. And now, Donald Trump. Donald Trump. This President’s Day includes him. Even when he is impeached or resigns after the 2018 elections because people have “been very, very unfair” to him, or whatever, he’s in history books. He’s a President. And because of that, there is no reason, ever again, to celebrate the Presidency. This entry was posted in Charter 17 and tagged America. Bookmark the permalink.